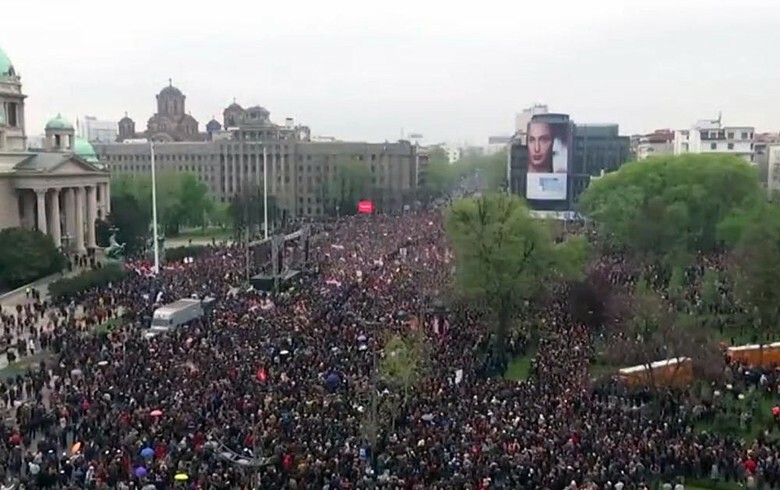 BELGRADE (Serbia), April 15 (SeeNews) – Thousands joined the anti-government rallies held in Serbia on Saturday in what the opposition claims to be the largest protest in the country in the last ten years. During the protest rallies this weekend, citizens demanded the establishment of a joint commission of representatives of the government and the opposition to guarantee a fair snap vote, as well as the appointment of new members of the electronic media regulator REM and new editorial boards at public broadcasters RTS and RTV, the Alliance for Serbia led by former Belgrade mayor Dragan Djilas, said in a statement on Sunday. Last month, the leadership of the ruling populist conservative party SNS approved a proposal for potential early parliamentary elections in June, the country's president Aleksandar Vucic said. SNS is organising a rally in Belgrade on April 19, as Vucic has called on his supporters across the country to join and promised that this would be the largest civil gathering in Serbia in half a century. A total of 165 out of the 250 deputies in the Serbian parliament support the SNS government led by prime minister Ana Brnabic. Three opposition parties represented in parliament are members of the Alliance for Serbia - the centre-left Democratic Party, Dveri, and the People's Party, with a total of 24 MPs. The Alliance for Serbia was established before the local elections in Belgrade held in March 2018. It was later joined by the leading opposition parties in Serbia, namely the Democratic Party, Serbian movement Dveri and the People's Party. The Serbian Left party too is a member of the alliance. The Alliance for Serbia has organised a series of protests against what it sees as an increasingly autocratic rule by Vucic and the government led by conservative populist party SNS. Protests have been held in 60 Serbian cities in addition to Belgrade for 16 weekends in a row since December 7, following the assault on Borko Stefanovic, leader of the Serbian Left party.